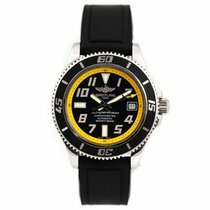 The SuperOcean diving watch has been a part of Breitling's catalog for over 60 years. With water resistance to 2,000 m (6,562 ft), a helium escape valve, and chronometer-certified precision, these pieces appeal to divers of all levels. Breitling premiered the SuperOcean in 1957, the same year Omega introduced the Seamaster 300. Blancpain and Rolex had already released their Fifty Fathoms and Submariner models a few years earlier in 1953, setting the bar for new diving watch standards. The original SuperOcean was water resistant to 200 m (656 ft), making it just as robust as its competitors. Nowadays, synthetic glass has given way to scratch-resistant sapphire glass. There's also now more than just a single SuperOcean – there's an entire series, ranging from models that are water resistant to 200 m (656 ft) to models that can go down to 2,000 m (6,561 ft) . The smallest version is 36 mm and the largest is 46 mm in diameter. Stainless steel is used for the case material, although some versions feature a black PVD coating. 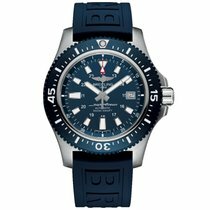 For a long time, Breitling also offered the SuperOcean as a chronograph. Today, however, you will only find this complication on similar watches in the SuperOcean Héritage II and Avenger II collections. 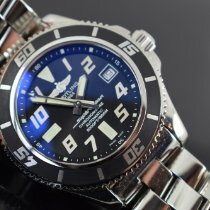 Timepieces in the standard SuperOcean series are equipped with mechanical calibers, all of which have been chronometer-certified since 1999. Some earlier models were powered by quartz movements. 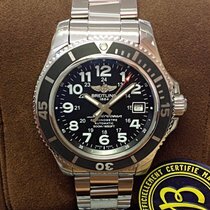 How much does a Breitling SuperOcean cost? Prices for a SuperOcean span a wide range. Vintage models, such as the three-hand ref. 1004 or the ref. 807 chronograph from the 1950s, are extremely rare. Examples in good condition regularly sell for between 18,000 to 25,000 USD. However, these prices are not without justification: You are getting a watch with a unique appearance. The inward sloping bezel and thin, 39-mm cases set these pieces apart from any of their competitors. Chronograph models from the 60s, including the ref. 2005 and ref. 2105, are somewhat more affordable. 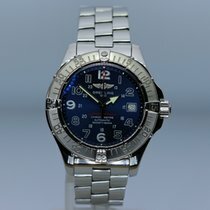 Plan to spend between 8,900 and 12,100 USD for one of these watches. If the vintage factor is not as important to you, collections from the early 1990s may pose an interesting and affordable alternative. They are characterized by their easy-to-use metal bezels on a raised "chimney" with small rider tabs at 3, 6, 9, and 12 o'clock. However, it's not just the chimney and rider tabs that make these timepieces special: Unlike most other watches, the bezel is actually attached to the case using screws. This means it will never accidentally come off the case. These 42-mm diving watches are water resistant to 1,000 m (100 bar, 3,281 ft) and come with black, blue, or bright orange dials. Be sure to set aside around 1,700 USD for a pre-owned model in good condition and almost 2,000 USD for a never-worn piece. 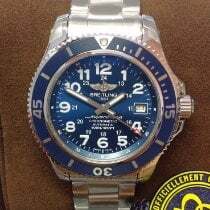 In 2005, Breitling presented the SuperOcean Steelfish with the reference number A17360. The Steelfish set itself apart from its sister model in two ways: It had a tidier dial and an improved water resistance to 1,500 m (150 bar, 4,921 ft). The Steelfish X-Plus (ref. A17390) followed only a year later. Its larger, 44-mm case could survive depths to 2,000 m (200 bar, 6,561 ft). Expect to pay around 2,600 USD for a never-worn, 42-mm Steelfish. You can shave 400 USD off that price by buying a pre-owned piece. The larger X-Plus model goes for about 2,400 USD pre-owned and 3,700 USD new. The SuperOcean 44 (ref. A17391) and SuperOcean 42 (ref. A17364) came after the Steelfish and were technically identical to their predecessor. 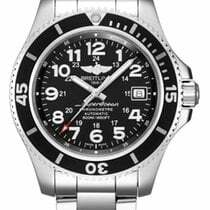 Their look, however, was not: The dial design was updated and the bezel saw Breitling's first use of molded rubber inlays. What's more, the rehaut on the smaller model comes in red, blue, yellow, white, or orange and contrasts beautifully with the black dial. The 44-mm version only has a colorful second hand. Prices for these timepieces float between 2,400 and 3,000 USD depending on their condition. The current collection was introduced in 2015 under the name SuperOcean II. Its cases come in three sizes: 36, 42, and 44 mm. This three-hand watch is powered by the caliber B17 based on the ETA 2824-2 and has a date display at 3 o'clock. Breitling equipped the bezels of these watches with the same molded rubber inlays seen in its predecessors. These timepieces have a blue, black, or white dial, a matching bezel, and either a stainless steel bracelet or rubber strap. Plan to spend around 3,400 USD on a new SuperOcean II 44 with water resistance to 1,000 m (100 bar, 3,281 ft). A pre-owned piece will run you about 500 USD less. The 42-mm version is water resistant to 500 m (50 bar, 1,640 ft) and costs about 3,200 USD new and 2,800 USD pre-owned. The smallest variant has a 36-mm case that is water resistant to 200 m (20 bar, 656 ft). Depending on its condition, this watch retails for between 2,300 and 3,000 USD. The SuperOcean 44 Special (ref. 17393) is a special edition model. While it may be identical to the SuperOcean II 44 on the inside, this timepiece offers a little something special on the outside, namely a bezel made of scratch-resistant ceramic . There are three versions of the Special available. One has a case with a black PVD coating, a black bezel, and a black dial. Another has a stainless steel case with a black dial and bezel. The final version also has a stainless steel case, though this time the dial and bezel come in blue. Each comes with the option of a rubber strap or stainless steel bracelet. The stainless steel models go for between 3,200 and 3,700 USD depending on the band. Pre-owned pieces are only marginally less expensive. Be prepared to spend around 4,300 USD for a never-worn all-black model and 3,500 USD for a pre-owned model. Until 2016, chronographs were also a part of the SuperOcean collection. Despite having a strong outward resemblance to the current standard models, their technology is nothing like that of their sister models. On the one hand, their cases were only water resistant to 500 m (50 bar, 1,640 ft). 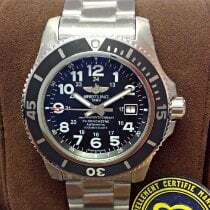 On the other, Breitling outfitted them with the caliber B13 based on the Valjoux 7750. This movement includes three subdials, which are located at 6, 9, and 12 o'clock, as well as a date display at 3 o'clock. Prices for a SuperOcean Chronograph sit between 3,400 and 4,300 USD depending on the model and its condition. With a quartz movement and water resistance to 2,000 m (6,561 ft), the SuperOcean M2000 is the black sheep of this chronograph family. This model is easy to spot by the layout of its subdials. The hour and minute counters sit at 2 and 10 o'clock, respectively. The small seconds dial has been relocated to 6 o'clock, and its date display has shifted to between 4 and 5 o'clock. Unlike the mechanical chronographs, the M2000's chronograph function can even be used underwater thanks to the patented magnetic push pieces. Expect to pay around 4,000 USD for a never-worn M2000 and 3,500 USD for a pre-owned model in good condition.